It’s easy to be overwhelmed by choice when researching a trip to China. There are sprawling megacities, soaring mountains, arid deserts and ancient ruins. Where does one start? Clearly, we were always going to Beijing and Hong Kong. Janey spent ten years working as an archaeologist so a visit to Xi’an to see the fabled Terracotta Warriors was also essential. Other than these three places, my attention kept getting drawn to Sichuan province. Why Sichuan? Well, the scenery looked stunning for a start. It was also reputedly home to one of the best, and spiciest, regional cuisines in China. Most of all though, it was about pandas. Sichuan is the best place in China to see one of my very favourite animals. Going to China and not seeing them would have been unthinkable, like not drinking beer in Germany or missing Macchu Pacchu in Peru. We had to go to Sichuan. On December 23rd 2015, we boarded a domestic flight from Beijing to Chengdu, the capital city of Sichuan province. It was one of the more traumatic flights I’ve experienced. Honestly, I’ve got no idea how the man in front of us could spend an entire three hour flight hawking up phlegm. This is exactly what happened though. As it was an evening departure from Beijing, it was gone midnight by the time we arrived in Chengdu. My rucksack did not arrive with us. After the hassle that I’d had at immigration in Beijing, I was beginning to get suspicious. Were these things happening because we were going to Tibet? We would spend the whole of December 24th in the hostel waiting for word of where the bag was. This meant that we missed out on going to see the Giant Buddha in Leshan. Here’s a picture that I didn’t take of it. It’s fair to say that we’ve had better Christmas Eves. Christmas morning dawned and my rucksack still hadn’t appeared. However, we were both determined to make the most of the day. This was the main reason for our visit to Chengdu. The Chengdu Research Base of Giant Panda Breeding (or Chengdu Panda Base for short) was set up in 1987 to help combat the sharp decline in panda numbers in the wild. As the name implies, the base has a very successful breeding programme and can share some of the credit for the fact that panda numbers are now increasing again. As the base is located about an hour outside of the city, we organised transport through the hostel and got driven out there with two German girls. Driving out of the city, I felt my spirits plummet. The pollution was horrendous and the outskirts looked indescribably bleak. How on earth could the poor pandas survive if they had to breath this dirty air? We pulled up at the centre just before 9:00 and made our way in. At this point, our driver spoke to us for the first time. In halting, broken English he pointed at a number on the map and said “Here. Baby. Pandas.” Janey immediately went into some sort of involuntary convulsions. We walked a little way into the park, rounded a corner and there they were! My previously low mood was cured instantaneously. There were about ten pandas prostrated on a platform, munching on vast quantities of bamboo. We stayed there for well over half an hour, mesmerised by how docile and content they were. No wonder pandas are supposedly sexually reticent, they are obviously too busy eating all the time. Next was the main event of the morning; the baby pandas. The highlight was seeing one little panda continually trying to climb up a tree. He didn’t quite have enough strength in his legs and kept sliding back down and landing on his backside, He would then go back and try again and achieve exactly the same result. At this point, I thought Janey would either combust or enrol on a rapid Sichuanese and zoology course in an attempt to get a job as a keeper. Later, we encountered the red pandas. These are much less well known than their black and white counterparts. They are also considerably smaller and considerably more aggressive. I particularly enjoyed watching one of them trying to take on a peacock who was trying to steal his food. It’s not the size of the dog in the fight, it’s the size of the fight in the dog. Red pandas presumably know this mantra and live their lives by it. By late morning the park was getting crowded and it was time to go back to the city. Unfortunately, we then had to spend Christmas Day afternoon shopping for new clothes, as my bag still hadn’t shown up. However, it’s certainly not hyperbole or exaggeration to say that the pandas saved our Christmas that year. I don’t think I’ve ever gone to a country with as many mixed feelings as when I travelled to China in December 2015. On the one hand, I wanted to walk on the Great Wall, taste authentic Chinese food, and most of all, I wanted to see pandas. Conversely though, I was nervous about the pollution and I’d heard all the tales of people spitting on the street and supposedly having no manners. Furthermore, at the back of my mind, there was always the nagging dread that I wouldn’t be allowed into the country, as we’d arranged to go to Tibet, with a Tibetan tour agency. Therefore, on the day of our flight from Seoul, I was a bag of nerves. We were going to be in China for three weeks. What if all the horror stories were true? I needn’t have worried. Beijing turned out to be a fantastic city. China doesn’t really do gentle introductions but our first couple of hours in Beijing were pretty full on. The first problem was at the airport. My passport seemed to set off some sort of check and the border guard and his supervisor spent around ten minutes looking at it and making phone calls. I had my Chinese tourist visa so all I could think of was that they’d realised I was going to Tibet and they’d decided not to let me in for that reason. After what seemed like an eternity though, I was eventually allowed in to the People’s Republic of China. We left the airport and got our first view of the dreaded haze. It was even worse than we had expected. Apparently, that week the pollution had been so bad, there had been a red alert, which is almost unprecedented even in Beijing. Next, we got completely and utterly lost, whilst trying to find our hostel. Eventually we did find a hostel, but it was the wrong one. This was when things started to turn for the better though. A guy who was working at the hostel we’d arrived at went completely out of his way to walk over a mile to the correct hostel with us. He even carried one of Janey’s many bags. When we got there, I offered to buy him a beer to say thank you. He wouldn’t hear of it. He had just wanted to help. It was an incredibly kind gesture and it made us think that the negative reputation that the Chinese have in many other Asian countries isn’t entirely accurate. After buying dust masks, the next day we set out to explore the city. Our first port of call was the wonderfully named Temple of Heaven. This is located at the centre of a large municipal park. Walking through the park, we saw groups of old ladies doing Tai Chi and a bunch of middle aged people playing a game of keepy-uppies with what looked like a large shuttlecock. Some of them were extremely skilful and none of them seemed remotely bothered by the smog, it was just a fact of life in Beijing. The Temple itself was spectacular and certainly worth a visit. Later, we visited another spectacular site. The Birds Nest Stadium and the Aquatics Cube were the venues for the athletics and swimming events at the 2008 Summer Olympics. We’d timed our visit to be there when it was dark, as at night both buildings are illuminated. The effect is mesmerising. Finally, we finished off our first full day by exploring some hutongs. These are a type of narrow street or alleyway, where you can find some excellent shops, cafes and restaurants. They were extremely cool and you could spend hours wandering around and getting happily lost in them. Day three was the highlight of our time in Beijing. We booked a trip from the hostel to go to the Mutianyu section of the Great Wall of China. Everyone has seen the Great Wall on television, and in books but nothing prepares you for actually being there. There are not enough superlatives in English, Chinese or any other language to describe just how awe-inspiring a sight it is. I’ve been to Macchu Picchu, the Taj Mahal and Angkor Wat and the Great Wall was the equal of all of them. We took a cable car to get us up to the wall and then went for a walk. 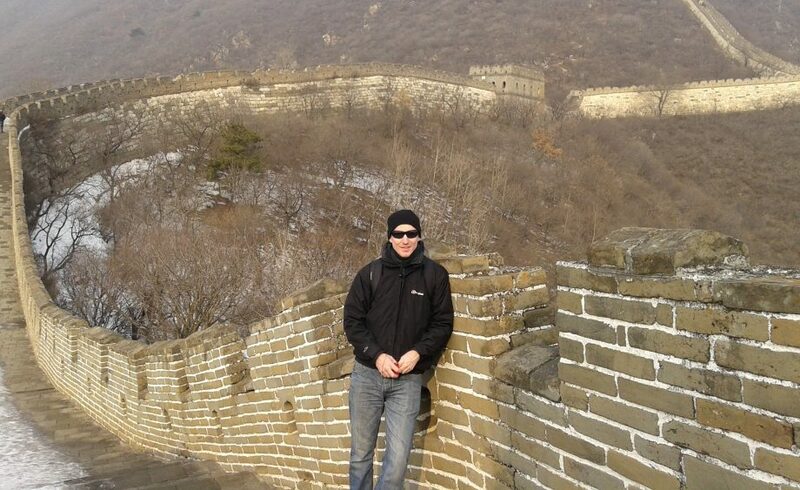 Mutianyu is easily accessible from Beijing but is isn’t the most touristy section of the wall. That “honour” goes to Badaling. Because of this, and the fact that we were there in mid-December, there were surprisingly few other tourists on the wall. Overnight, there had been a light dusting of snow, which made the wall look even more stunning. The only downside was that the smog was still visible, more than 60 kilometres outside the city limits. We walked for around an hour tolerating some steep sections, slippery underfoot conditions and one extremely persistent salesman, until we reached the end of the walkable part of the Mutianyu section. Beyond this, the wall is in a ruined state and it wouldn’t have been safe to have gone any further. Interestingly, at this point a lot of people had tied little red bits of plastic in a tree, presumably as some sort of offering designed to bring good luck. It wasn’t the most environmentally sound offering but it still looked pretty cool. To put the seal on a truly memorable day, when we descended from the wall, we ate one of the best meals we would have in all our time in China. We’d been to the symbol of China. On Day four, we had to go the centre of the Chinese Universe; Tiananmen Square. For many Westerners, Tiananmen conjures up uncomfortable images of the massacre of innocent civilians in 1989. Not going there though would be like visiting Paris and not going to the Eiffel Tower though. We had to see it. From the moment we emerged from the subway, the high security presence was evident. We had to go through metal detectors to gain access to the square and then once on the square, there were large numbers of troops, ready to accost any potential troublemakers or dissenters. From one end of the square the smiling face of Chairman Mao looks down onto the people below from Tiananmen gate. I’m glad that we went there to see it, but it wasn’t always a comfortable experience. It was a reminder that after more than fifty years of Communism, China is still an extremely repressive place and there is little sign of that changing in the near future. From Tiananmen, we went to the Forbidden City. For most tourists, this is one of the highlights of their visit to Beijing but I was disappointed. Perhaps, I was still feeling subdued after the police state feeling of Tiananmen but it didn’t really enthral me at all. Yes, the buildings are spectacular, but it was extremely overcrowded and we were often jostled out of the way by domestic tourists, who didn’t want to wait a few seconds longer to get the photo that they wanted. My mood was lifted back up by walking through some really trendy hutongs to get to the Drum Tower. There, we witnessed a powerful and visceral drumming performance. It was certainly one of the more impressive live music performances that I’ve seen on my travels, although an Indonesian Guns N Roses covers band may run it quite close. After the Drum Show, we had to go back to the hostel and pack our bags for our internal flight to Chengdu. Just like that, our four days in Beijing were over. I was worried when we went there but I had certainly learned to love it. In fact, the highest compliment that I can pay it is that I preferred it to Tokyo or Seoul (not Hong Kong though, no big city in that region beats Hong Kong) and I’m amazed to say it; I’d love to go back again sometime. It was 5:30 am, pitch black and freezing cold. We were on a small country road in Myanmar and the lights had just failed on Janey’s rented E-Bike. This wasn’t the start we were hoping for from our trip to Bagan. Bagan is Myanmar’s answer to Angkor Wat. Hundreds of temples and pagodas are scattered across a vast plain in the south-west of the Mandalay region. When Tony and Maureen Wheeler travelled around South East Asia in 1975 (the trip that spawned the first Lonely Planet book) they declared Bagan to be their highlight of the entire region. For years though it was neglected due to Myanmar’s self-imposed isolation and a devastating earthquake the year after the Wheeler’s visit. Now though the secret is well and truly out. Hordes of tourists are flocking into Myanmar and Bagan is the top destination on most of their lists. The most popular thing to do in Bagan is watch the sun rise over the plains, thus illuminating the temples and the hot air balloons that fly over them at dawn. This was how Janey and I found ourselves in our little spot of bother. It was our first full day in Bagan and we’d set the alarm for the ungodly hour of 4:45, to ensure that we’d find a good spot to watch the sunrise. As the temples are spread out over a very large area, you need some transport to get around. Unlike Siem Reap, there are no tuk-tuk drivers waiting around for a fare at 5am. You have to go it alone. Consequently, the most popular type of transport are E-Bikes; noiseless environmentally friendly electric scooters that work on dirt tracks as well as the main roads. Surprisingly for someone who has travelled so much, I’ve never actually ridden a motorbike. There was a misadventure involving a quadbike and a wall in Ecuador, which I’ve always maintained was down to the bike locking up, but may have involved the tiniest bit of driver error but that’s all. Therefore, it was with more than a little trepidation that I got on the bike and tested it out. It was then that I made my first major error of the day. I asked the guy if he had any helmets. The look he gave me was half horrified, half pitying. “What is this halfwit thinking?” he presumably muttered to himself in Burmese. “This is Asia, we don’t do helmets here.” I was crushed. He must have taken me for some sort of Asia freshie, not the gnarled veteran of many Asian campaigns that I like to think I am. Nervously, we edged the bikes out onto the road, trying not to think of what my mother would say if she could see me riding without a helmet. In the middle of the night. In a country with notoriously bad roads. Everything went reasonably well at first; we got confident enough to push the speed up to a dizzying 30 kph. Then things started to unravel. We couldn’t find the temple we were looking for and then Janey’s bike light failed. As so often happens in situations like this though, a guardian angel appeared. His name was Lin Lin and he was just cruising around on his motorbike at 5am. We explained our predicament to him and instead of guiding us to the place that we had intended to go to, he took us to a much smaller pyramid. We had it all to ourselves and arrived in time to witness a truly mesmerising sunrise. Afterwards, it turned out that Lin Lin wasn’t just an altruist. He did have some paintings to sell. They were of such good quality though and he had been so kind that we bought two of them. They now hang proudly in the living room of our flat. Thanks Lin Lin! Over the next three days, we took the E-Bikes all over Bagan and saw as many temples as possible. So now, there’s some advice I’d like to impart to anyone who is thinking of visiting Bagan. Firstly, don’t go chasing particular temples. Bagan isn’t very well signposted and if you do this you’ll just end up getting frustrated as you’ll spend a long time trying to find what you’re looking for. You may even end up with the E-Bikes stuck in thick sand as you’ve gone off track to “find a shortcut.” It’s far better just to ride around and stop whenever you see something that you like, which will be frequently. Secondly, it’s asking a lot of yourself to see sunrise and sunset in one day. Try to spread it out so you see one of each on different days. However, if your time is limited and you really have to choose, go for sunrise. The colours are better and the balloons over the temples are wonderfully photogenic. Earlier, I said that Bagan was Myanmar’s answer to Angkor Wat. So, how does it compare to South East Asia’s most visited tourist attraction? Thee honest response is it’s great but it isn’t as good as Angkor. Part of this is due to the fact that it seems less authentic. A lot of the temples were crudely rebuilt after the earthquake, meaning that it doesn’t have the same feeling of antiquity. Furthermore, as more and more tourists flood into Myanmar, the local authorities will need to start signposting things better and providing maps that are actually accurate! However, taken on its own merits, Bagan is a highly photogenic and pretty unique place. It’s certainly worthy of its top billing in Myanmar. I’d highly recommend it. You have to pay $20 US to enter the Bagan Archaeological Zone. Once you’ve bought this, you’re free to travel around as much or as little as you like. At 5897 metres above sea level Cotopaxi, in Ecuador, is one of the highest active volcanoes in the world. Visible from Quito on a clear day, the majestic monolith dominates the skyline from miles around. 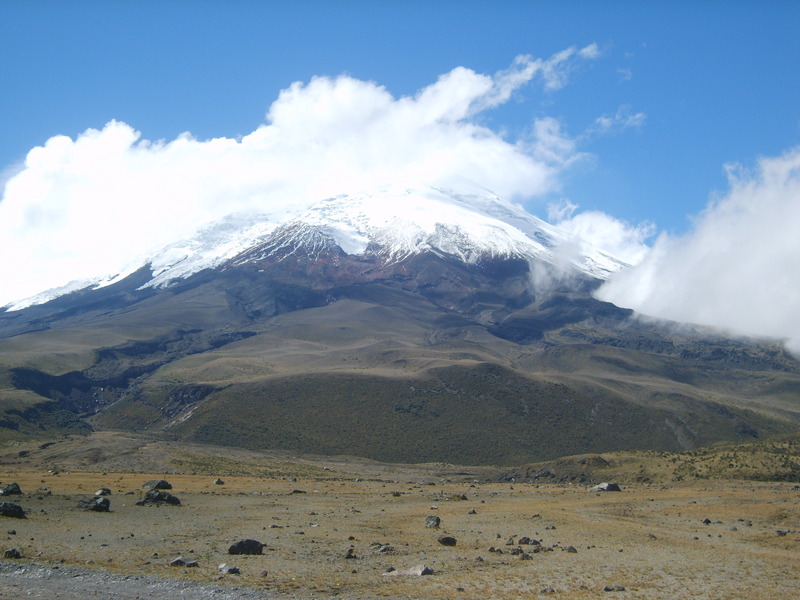 Its perfect cone and snow-capped peak make it the most stunningly beautiful of all Ecuador’s volcanoes. 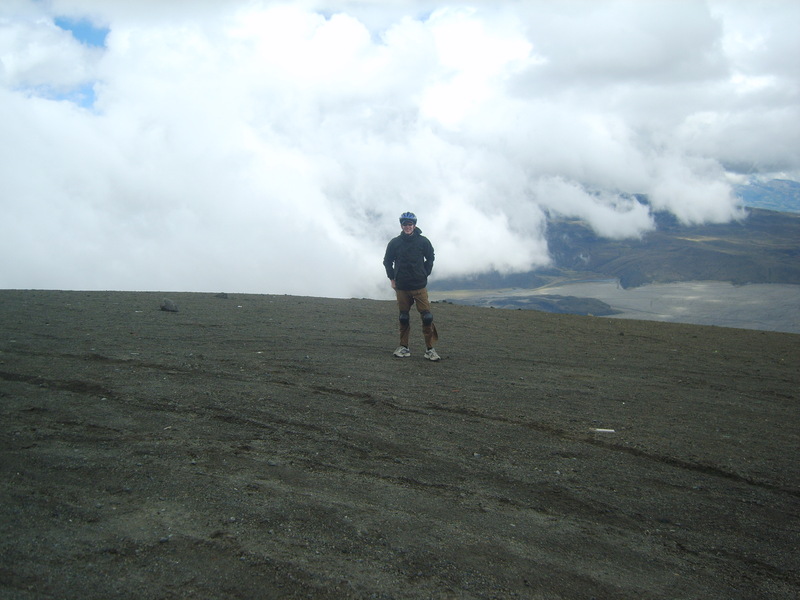 A popular challenge is to attempt to hike to the summit of Cotopaxi. Beginning from the Refugio at the height of 4800 metres, the brave climbers trudge through deep snow drifts and fight against debilitating altitude in their battle to reach the top. Whilst it is obviously massively rewarding for those who do succeed, the combination of the altitude and the notoriously unpredictable weather patterns that surround Cotopaxi mean that success is far from guaranteed. Unfortunately, many climbers return to Quito disappointed, having had their attempts thwarted. An interesting alternative for those who fancy a bit of adventure, but don’t want to go to the top of the mountain, is to mountain bike down it instead. Having already biked down Bolivia’s notorious “Death Road” a couple of months previously, this was definitely a challenge that I wanted to undertake! 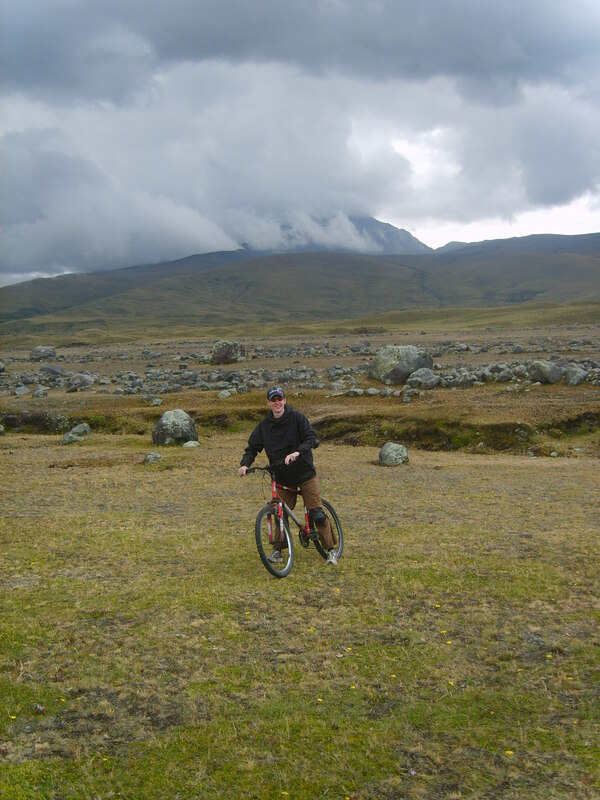 The Biking Dutchman was established in 1991 and has been running day trips down Cotopaxi ever since. It is easy to see why the company’s success has endured; the ride is utterly exhilarating. The minibuses leave Quito at 7am and make their way to the national park, eventually stopping 4500 metres up the mountain. From here the views of the mountain are breathtaking and provide wonderful photo opportunities. After a safety briefing, we tentatively began our descent. The first 8 kilometres of the ride were all downhill, on a frightening gradient, and we achieved some truly phenomenal speeds. Whilst the ride is suitable for most ability levels, I wouldn’t really recommend it to complete beginners as the bikes were basic and only had front wheel suspension. This meant that maintaining balance was a tricky proposition. I think my knuckles were white from gripping the handlebars so hard! Thankfully, I made it through this stretch with only a couple of minor falls. When the descent has been completed the ride slows down and takes on a more sedate nature. After the rush of going downhill and holding on for dear life, it was pleasant to actually do some pedalling and take time to appreciate the bewitching lunar landscape. The massive boulders that have been spewed from the volcano in its moments of fury make for particularly compelling viewing. Once we had eaten a delicious, and much needed, home-made lunch, we embarked on the final section of the ride. This took us across barren grasslands before plunging through lush pine forests. Pedalling across the grasslands and having to continually change gears was torturous. However, once we headed into the forest, all the effort seemed worthwhile. Here it was possible to really put my foot down, and get some serious speed up, flying over rocks and through puddles in the process. The speeds were comparable to further up the mountain but without the same fear factor, making this my favourite section of the ride. Finally, after four hours of hard riding, we reached the end point. Many of us felt seriously battered and bruised. None of us said that we didn’t enjoy every single minute of it. Disclaimer: This is an old article which I wrote eight years ago for a sadly now defunct paper called “The Ecuador Reporter.” I’ve updated the article so all price information is current, but please don’t blame me if anything else is out of date!